All year long, Steve Alford has been brewing something in Los Angeles. The embattled coach has had a superb bounce back season for UCLA. That was no more evident then on Saturday night as the Bruins took down the Arizona Wildcats in Tucson. UCLA’s resurgence can be attributed to freshman sensation Lonzo Ball. The sure-fire lottery pick has proven himself to be the best pure point guard in a draft class filled with talented point guards. He leads one of the most explosive teams in the country. UCLA isn’t always dialed in defensively because they’re so adept on the other end. The Bruins will certainly need to defend better in March, but if they don’t it won’t stop them from being one of the toughest outs in the Big Dance. Let’s do some conference tournament previews. ATLANTIC SUN: Florida Gulf Coast, once again, proved to be the class of the Atlantic Sun as it won another regular season title. With many of its primary challengers defecting from the conference recently, the Eagles have enjoyed life at the top. Despite that, they’ll have a difficult time winning the automatic bid here. Lipscomb watched crosstown rival Belmont dominate this league before it left and is ready to step up to primetime. The Bisons have already beaten the Eagles on their home court and that’s why they’ll win the automatic bid. BIG SOUTH: Winthrop and UNC-Asheville tied for the regular season title at 15-3 with Liberty right on their heels at 14-4. Those three have separated themselves from the pack and look primed to take the bid. UNC-Asheville has the most experience here and thus the Bulldogs are the team no one wants to see in this tournament. Too bad. The Bulldogs will be the team that wins it. OHIO VALLEY: This one is simple. If Belmont doesn’t breeze through the conference tournament it will be one of the more shocking results in any conference tournament. The Bruins finished five games ahead of their next closest competition and look like a team that can pull off an upset in the Big Dance. NORTHEAST: Mount St. Mary’s looked to be clear favorites in the NEC until last week when LIU beat the Mountaineers on their home court. It’s going to be a slugfest for the Mountaineers as 7 of the 8 teams that qualified for the conference tournament finished at .500 or above. This will be competitive, but the regency of the the loss to LIU will work in their favor and they’ll return to the dance for the first time since 2014. AMERICA EAST: The Vermont Catamounts went 16-0 in conference play and are as heavy favorites as Belmont is in the OVC. This tournament will be played on the home court of the higher seeded team. That means teams will have to travel to Vermont to attempt to do something none of them have been able to do all season – beat the Catamounts. That won’t happen. Vermont goes dancing. AMERICA EAST: Albany was by far the most dominant team in the league this season. The Great Danes didn’t lose their first conference game until Feb. 17. With all games being at campus sites its going to take a lot to keep Albany from repeating. MISSOURI VALLEY: This certainly was a top heavy league this year as Wichita St and Northern Iowa ran away and hid from the rest of the conference. That’s why it is expected that those will be the two teams playing for the championship on Sunday. In the rubber match, expect Wichita St, the team with the superior experience and talent, to cut down the nets. METRO ATLANTIC ATHLETIC: A loss on the last day of the regular season is the only thing that kept Iona from winning the league by three games. The Gaels’ misstep doesn’t scare me too much as they’ve been to the tournament recently and will be tough prep on short rest. The tournament will be competitive as always, but expect Iona to go dancing. SOUTHERN: As good as Wofford has been over the course of the year, Chattanooga has been right there all along. The two squads were far and away the class of this conference and appear to be on a collision course for a Monday night showdown. The teams won on each other’s home floor so this creates a bit of intrigue. Wofford is the favorite here, but not by much. COLONIAL: The regular season in the CAA finished in a four-way tie for first place. If there’s anyone out there who’ll tell you they have this league pegged than than call that person’s bluff. On a true neutral court in Baltimore anything can happen. Given the disappointment from last season and performing well against the other top teams in the league, I’m going with William & Mary. WEST COAST: There may be many people wondering if there’s a major kink in the armor of Gonzaga after losing to BYU in it’s last regular season home game. I am not one of those people. BYU played fantastic and could very well be a tournament team itself, but Gonzaga is one of the best teams in the country and it’ll have motivation. The Zags will win in Vegas. SUMMIT: South Dakota St and North Dakota St went back and forth this season vying for the Summit League’s No. 1 spot. At the end of the day, both teams finished with 12-4 records with South Dakota St winning the tiebreaker. Playing the tournament in the state of South Dakota gives the Jackrabbits a bit of a chance. Despite that, there’s a team on their side of bracket who’s beaten them and is even closer to the site where the tournament will be played. That’s the South Dakota Coyotes and they’re my upset pick to win the Summit League. Before we get to the bracket. Here’s a prediction for a conference tournament beginning today. AMERICA EAST: Vermont blew through the regular season with just one blemish on their record in a three-point loss at runner-up Stony Brook. In the rematch, the Catamounts won by 16. In fact, the rest of the conference hasn’t been close as only one of their 15 conference wins have been decided by fewer than 10 points. Nothing indicates that Vermont isn’t going to the Big Dance. Good for through games of 3/7. PATRIOT LEAGUE: Defending champion Bucknell was rolling along in the Patriot League until mid-February when two losses tarnished its perfect league record. The fact that one of those loses came to second-place finisher Lehigh at home would make me extremely nervous if I were a Bison fan. For that reason, and the fact that the Mountain Hawks have been just as good, I’m taking Lehigh to go dancing. WEST COAST: Saint Mary’s won the league outright in a minor upset. However the Gaels finished just one game ahead of Gonzaga and two ahead of BYU. This will be a competitive tournament with the four teams having a legitimate shot at cutting down the nets in Las Vegas. BYU in its first season in the WCC is used to playing in Vegas, is relatively close to Vegas and will take the matter out of the committee’s hands by winning the WCC championship. MISSOURI VALLEY: Wichita St and Creighton has been the class of the Missouri Valley this season, but this is a tournament that has seen its fair share of upsets over the years. That being said I find it very hard to pick against the Shockers the way they’re playing right now. I expect them to beat a scrappy Missouri St team in the finals. NORTHEAST: Wagner got everyone’s attention in December after it upset Pittsburgh. The Seahawks followed that with an impressive conference record of 15-3. The problem though is that two of those losses came at the hands of the regular season and defending tournament champion Long Island. The Blackbirds wouldn’t have to play Wagner or Robert Morris until the finals and will play every game of the tournament at home. I like them to repeat. AMERICA EAST: This will be a good one. I would not be surprised if regular season champion Stony Brook, Vermont or 2011 NCAA tournament team Boston University won this tournament. I think Vermont is due for the win I thought they’d get last season. The Catamounts are going dancing. Yesterday, all hell broke loose on the mid-major level. Number 1 seeds in the Colonial, Missouri Valley, Metro Atlantic Athletic, America East, and Sun Belt all lost. In addition to that; College of Charleston had to come back from a double-digit second half deficit and Bucknell won with the aid of a no call to stave off disaster. I say all of this to prove that’s its March and no one is safe. Not on the mid-major level. Not on the high-major level. Even Purdue lost to lowly Iowa on Saturday. A lot of people, this time of the year, get extremely concerned with seeding, but that’s not nearly as important as playing well. Kansas was the No. 1 overall seed in the tournament last year and look how much that helped the Jayhawks in bowing out early in the Big Dance. I know being a No. 1 seed is good and is helpful, but playing well helps even more. Last season, Butler and Michigan St both got to the Final Four as No. 5 seeds. The name of the game is not getting a high seed. It’s winning. MID-AMERICAN CONFERENCE: This was once again a sub par year in the MAC as failed to cracked the top-15 in Conference RPI. 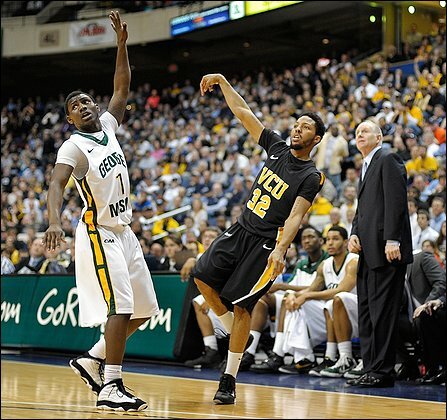 In fact, it sits at 20 with conferences such as the Northeast, Atlantic Sun and Ivy in front of it. Due to that fact, it’ll be another one-bid year for the conference, which magnifies the importance of the conference tournament. Kent St won the regular season title, but it was just by one game over Miami (Oh) and Western Michigan. Despite the one-game difference, I do expect the Golden Flashes to make it to the title game and reclaim the MAC championship. SOUTHLAND: The Southland Conference has had some really good showings in the NCAA tournament in the past five years, but this doesn’t look like a year where that’s going to be the case. In fact, the winner of this tournament may be relegated to Dayton to play in one of the “First Four” games. McNeese St won the regular season title, but the difference between first and eighth place in this league is just three games. It’s going to be terribly difficult for the Cowboys to navigate this tournament successfully. Mike McConathy is the best tournament coach in this league and I expect him to lead his Northwestern St. ball club back to the NCAA tournament. SOUTHWESTERN ATHLETIC: The SWAC has needed one team to be head and shoulders above the rest of the league and that’s exactly what happened this season. Texas Southern was on auto-pilot for most of the conference season finishing with a four-game cushion for the league title. The Tigers should enjoy the same kind of success in the conference tournament. I expect Texas Southern to dance. BIG WEST: Long Beach St has had no peer in the Big West this season, running away with the conference title. In fact, outside of a minor blip at the end of January, the 49ers have been downright dominant in the 2011 calendar year. This team has won 15 of its last 17 with ten of those wins coming by double figures. There is no reason to believe that Long Beach St is going to forget how to win. The 49ers are the pick to win the Big West. METRO ATLANTIC ATHLETIC: For the past three years, Siena has been rolling through the MAAC like a warm knife through hot butter. The Saints once again coasted to the regular season title with a 17-1 record. They have shown vulnerabilities though. Not all of the Saints wins have been dominant and some have been downright close. Fairfield has a legitimate shot at pulling off the upset, but I don’t see it. The Saints seem to be extremely focused in their last two games and playing on their home floor will be a huge advantage. I expect Siena to go dancing again. SOUTHERN: This will be one of the more competitive conference tournaments in the country. The SoCon has wins over schools from the Big East, ACC, SEC, and Atlantic 10 this season. Those wins came from Appalachian St., Western Carolina, College of Charleston and Wofford. Throw in Davidson and there will be some high-quality hoops in Charlotte this weekend. In the end, you have to go with the team that’s lost only one game this calendar year. I expect Wofford to make its first trip to the Big Dance. WEST COAST: Once again, Gonzaga has proven to be the class of this league. It’s amazing to see the Bulldogs have the success they’ve had given the losses they sustain in the offseason. Despite that, Gonzaga has proven to be beatable this season and, over its record 11-year run, in the WCC tournament. Saint Mary’s and Portland are extremely capable of winning this tournament. There is a high probability of the two meeting in the semi-finals, a game in which Portland will win on their way to the WCC tournament title. AMERICA EAST: The top four teams in the America East are separated by two games. Stony Brook, Vermont, Maine and Boston University are all capable of going dancing. However, there’s one team who clearly has the number of the other three. In its six meetings with Vermont, Maine and BU; Stony Brook has a 5-1 record. They’ve won 10 out of 11 and are looking very strong. The loss to New Hampshire is a bit alarming, but it was the last game of the season and Stony Brook had nothing left to play for. The Seawolves do now and they’ll be going dancing.